The Grand 580 is a very complete RIB, especially considering its size. It drives and handles well, making it perfectly suited as an all-round sports boat. Plenty of thought has gone into the detailing of the 580. As the 6m RIB is a boat that appeals to both newcomers and experienced powerboaters alike, Grand’s G580 enters a field that has long been dominated by leading brand names. Historically speaking, this Ukrainian boatbuilder is relatively new to the game, but it has already established itself with a wide range of capable family-orientated RIBs. Our test boat was powered by an E-Tec 115hp HO. This is an ideal engine for this size and weight of boat, and being a 2-stroke it has a great spread of power. Surging out of Salcombe, the 2-stroke burble at low speed reminded me of the 2-stroke engines of old, just without that 2-stroke smell and pollution. Pushing the throttle forward quickly punched the boat onto the plane, and within 10 seconds we were running across the relative protection of Starehole Bay at 30 knots. There can be no doubting the howl of a 2-stroke outboard on song, and only a big V6 4-stroke can compete with it in musical terms. However, the G580 to all intents and purposes is a family boat, albeit one that has a bit of a hard-core inner character. It turns very quickly and in a reassuringly steady manner. This is predominantly down to its optional £2,200 hydraulic steering system, without which, I suspect, it would be a very different boat. You can hold it easily with one hand while cornering hard, and then quickly centre it back on track without a hint of delay or oversteer. It holds its line well, to the point where you will have no difficulty in digging the tubes in on ever-tighter circles. From this point of view it is ideal for towing skiers or water toys, though most will buy the 580 for its beach-hopping cruising credentials. Driving out of Starehole into the south-westerly swell, I got a chance to sample its bigger-sea side. I was told that it has a medium-vee hull, so all things considered it did a pretty good job of dealing with the sea state of the day. With the outboard trimmed fully in and the bow consequently down, it did a reasonable job of dealing with a head sea at speeds of between 20 and 25 knots. It is only in such conditions that you get an idea of how well a boat has been put together, and to be fair, the Grand’s hull uttered only a few complaints. The forward lines of the hull sharpen well for a medium-vee hull, and on the day this proved its worth. It has no tendency to lift its bow inadvertently, and I suspect this naturally good fore and aft poise is helped by having a relatively light engine and fuel tank located exactly amidships. However, it is not sufficiently rakish for any serious offshore use, which, to be fair, it is not designed for. One thing I will say is that the torque of the E-Tec makes working the throttle in conjunction with an oncoming wave pattern great fun, just as it does powering out of tight turns. With a stern sea the boat’s 2.45m beam is an asset, as it provides plenty of forward buoyancy. Just trim her out about 30% on the outboard leg and you can run with little risk of stuffing the nose. Its top speed is just shy of 37 knots, though at 30 knots the boat feels more relaxed, and if you are looking to eat up some miles – conditions permitting, and without complaints from the crew – this is the speed to hold. From an economy perspective, the E-Tec will return around 7mpg at 25 knots in ideal conditions. Plenty of thought has gone into the detailing of the 580. 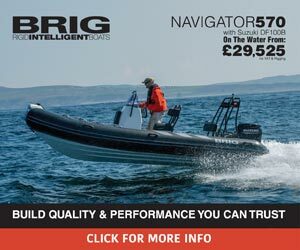 The console is just the right width for two, yet you can still walk forward without hanging over the tubes – a simple aspect that some RIB builders are blind to. The console is also designed with an aft-facing overhang, so the wheel and throttle are both perfectly located – without a stretch. If you are seated, your feet fit underneath, or if you take advantage of the flip-up seat bolsters and stand, everything is still spot on – although if you stand you have nothing to secure your feet against in rough weather. The aft seating is a typical wrap-around bench seat, which, like the rest of the upholstery, was done in the Silvertex upgrade. Silvertex, like Sunbrella, has a cloth-like texture yet is totally waterproof and harder wearing than conventional vinyl, and much safer for bare wet feet. As is the fashion today, synthetic teak is another upgrade – in this case a £949 one. You can opt for the normal non-slip deck, but it would detract from the appearance, and the SeaDek brand of flooring that Grand use is very well finished. Something I was impressed to see was two deck drains in front of the aft bench seat, which run through the aft locker and out through the transom, instead of just dumping water into the bilge for the bilge pump to deal with. Lifting the bench seat reveals a large aft storage locker, which on our test boat housed the battery, two oars and the optional teak table. However, there is still plenty of room to keep all the boat’s covers here and some more. You can opt for a transom shower, the 50L tank for which is housed in this locker, but at £868, many will think this a luxury too far – not to mention the additional 50kg sitting against the transom. In the stern quarters the boat’s designer, to his credit, has gone into overload. Aside from the neat retracting boarding ladder (standard), there are steps in the ends of the sponsons and two mini bathing platforms flanking the engine. Just to make sure you keep your wet footing going back and forth, you can have teak on top of the hidden quarter lockers, and the cleats are all ‘drop-downs’, so no painful toe snubbing. Moving into the forward section of the boat, there is the choice of an optional teak table. It is a neat touch, but at £675 including the sun deck kit I think some will question this, considering this is a 5.85m RIB. In the lower section of the console under the forward seat you will find yet more storage space, and underneath the sun pad sits a big storage locker that is perfect for numerous wetsuits. Like all the other lockers, the forward locker is superbly finished internally. In keeping with the clean line of the boat, the bow cleat drops down into a moulding that houses both a bow roller and navigation lights. The Grand 580 is a very complete RIB, especially considering its size. It drives and handles well, making it perfectly suited as an all-round sports boat. It is not an offshore boat in the true sense of the word and is not built to be such, although it is reasonably capable in rough water. It is solidly built with a lot of attention to detail, has plenty of storage and is very nicely finished – though it does really require the synthetic teak decking and upholstery upgrades to look the part. Given that it is not expensive, it should prove a popular choice for those looking for a versatile, stylish all-rounder.